Luke Farmer Presents Research at Undergrad Math Ed Conference! 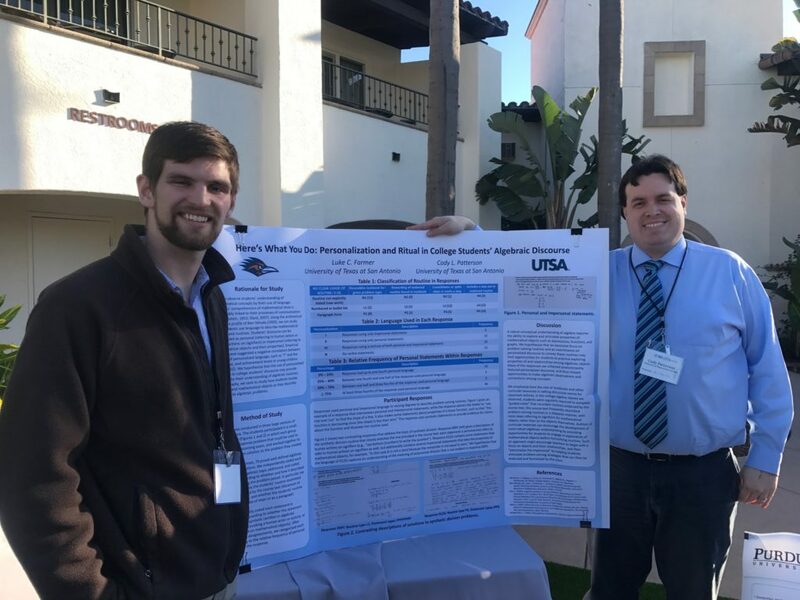 On February 23, Luke Farmer, a UTSA mathematics major, presented his poster, “Here’s What You Do: Personalization and Ritual in College Students’ Algebraic Discourse,” at the 2018 Conference on Research in Undergraduate Mathematics Education. Luke studied how students in college algebra classes describe routines in their mathematical work, and used the arithmetical discourse framework of Ben-Yehuda, Lavy, Linchevski, and Sfard to investigate how students present their mathematical reasoning in terms of human actions on symbols or in terms of mathematical objects and their properties. Dr. Cody Patterson served as Luke’s mentor for the project.